Delightful four bedroomed three bathroomed private pool home near the golf course. 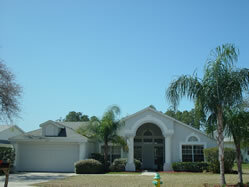 Great 4 bedroom/3 bath rental villa with private pool near the golf course. Easy access to Orlando and Busch Gardens. bright and cheery home with room for eight. The master bed has a queen size bed and ensuite bathroom. Second bed has a full size bed and ensuite shower room. Third and fourth bedrooms share a 3rd full bath, each bedroom contains two twin beds. Minutes away from supermarket and shopping.